This page attempts to explain a few of the essential “rules” of vehicle design. You may be thinking that there are no rules, surely every designer is allowed to do whatever they like? Well obviously that is true, but cars have to adhere to laws and type approval regulations, which gives certain constraints. That still leaves room for a large amount of artistic expression. What I’m talking about here are mainly common aesthetic practices and traditions- which are complex (enough to perhaps be re-visited many times here). These aesthetic tastes vary across national cultures, but as cars are sold globally (or more accurately, brands are), and most certainly designed by globally influenced people, these cultural tastes are often purposely discarded in the design process. There are also constraints that are forced by economics, and manufacturing processes. All these change over time, or occasionally shift more radically, but cultural aesthetic taste is by far the slowest of these to evolve and therefore more timeless and consistent. As you may have noticed, most cars, even across eras, look very much alike as a result of these principles. Restrictions of three dimensional form can be applied due to the majority of cars being manufactured from the same material, while using the same propulsion system. 99% of production cars are manufactured from steel (or at least metal! ), with plastic accessories, and glass windows, and are powered by internal combustion engines that burn an oil based fuel. Sheet steel is not easy to manipulate into shape. Car panels are stamped by enormous presses from very thin (around 1mm! ), flexible sheet metal, and strength comes from curvature. As a result you will never find a completely flat surface on any car! Almost all these metal cars are welded together from these sections or panels of steel, creating joins we call panel gaps. The first principle to follow is that of curvature. No matter how subtle the curve, every single surface on any car is curved. To keep design and manufacturing simple, cars tend to concentrate curvature in one direction. Most of the form is horizontal to the ground. 21st century car design is certainly changing this simplicity though, with many new vehicles such as BMW’s ground breaking designs showing complex interactions of differing curvature. Using this simple example we can see what is called the shoulder of the car, or otherwise known as the catwalk. All cars have this form, varying from being barely visible, to being the dominant feature of the car (Audi TT). The shoulder can rise or fall (BMW Z4), but is generally almost perfectly horizontal along the length of the car. The best view is from the front. This straight horizontal shoulder is present along the door of nearly all cars. The yellow line is a basic outline that can be applied to all cars. The width of the shoulder will vary, but the principle that the widest part of the car is along the center, between the wheels, rarely varies. The curve of the shoulder decides where the light and shadow divide along the car. Sometimes this point can be exaggerated by a sharp edge, or even a crease, as on the BMW 3 series. The top half in front view is also extremely similar on every car. The angle of the side windows is known as tumblehome and is always angled in from vertical apart from very rare exceptions (eg. Fiat Multipla). The side glass is not curved from the front view. The roof also follows the principles of never being flat, and is usually curved in both directions for maximum strength. Nearly all cars will have curvature in plan view. Aerodynamics are the main reason for this, along with styling issues involved in hiding front or rear overhangs. The main area for curvature in the plan view is the glasshouse, the top half of the vehicle shape, where the windows are. The glass on cars is only ever single curvature. This is due to the lens effect of double curvature glass! The yellow lines show the usual shape of the glasshouse, tapering to the rear. There are also some regulations governing the windscreen angle, which must never be less than 30degrees from horizontal. 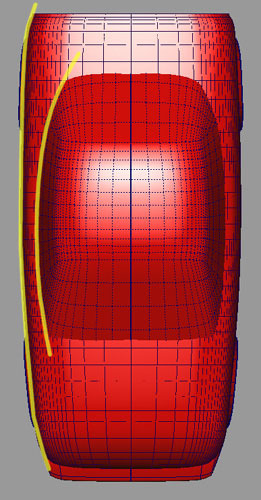 Plan view curvature can vary a lot on the bodywork of cars, with larger cars often showing much more shape than smaller ones. 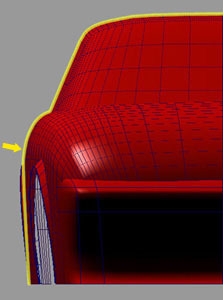 Large front and rear overhangs (overhang is literally how much the bodywork hangs over the front or rear axle line) are hidden by rounding the corners of the car in plan view. The side view shows how the screen has no curvature from top to bottom. Also we can see how the main shoulder line of the car is horizontal, with a slight angle to the upper part of the bodywork. This slight angle is known as wedge, and is also a matter of aerodynamics. Also note the slight wheel arch lip. This is nearly always present to finish the edge of the metal panel neatly. Some cars have large wheel arch shapes. Traditionally these blend into the body smoothly, but a more modern trend is to emphasize the join (Opel Astra, Ford Focus). Probably one of the most restrictive aspects of vehicle design is known as packaging. This is simply the way that a designer must fit all the components that make up a car, inside specified dimensions. The largest and most important objects to be packaged are the occupants, and the engine. These two components completely dictate the overall dimensions and proportions of every car. Vehicles involve some of the most complicated packaging problems of any product, as there are so many components, and endless safety considerations to integrate. Modern technology means that engines and other components are getting smaller, creating more space for occupants through innovative solutions (Mercedes A-Class), but traditionally there are still only four main ways of packaging a vehicle. The diagram shows these solutions, using the basic components of engine, transmission, cooling radiator (grey) and driver (red). It should be clear how these components affect the overall silhouette of the car. The position of the driver and glasshouse also dictate the position of the doors, which are not shown. All the cars have front mounted radiators, which need an aperture to feed air into them, but additional venting is usually needed around the engine. This results in apertures in varying positions, so it is important to always consider the internal architecture of the vehicle. Most of these examples are 2 seat cars, but it should be clear that the number of seats in a vehicle will have a major effect on the size and shape. 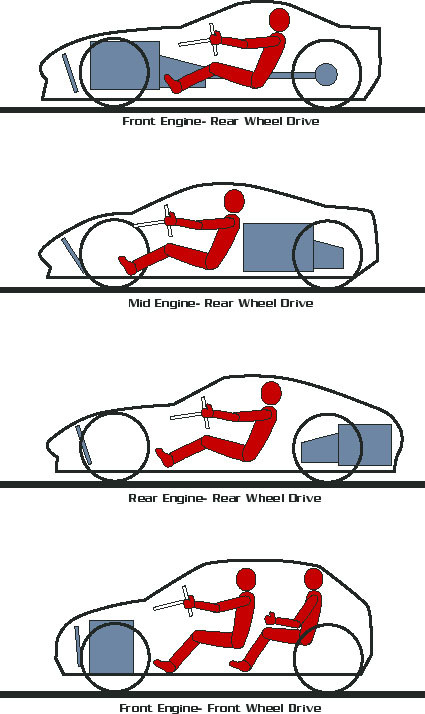 For example, the diagram of a front wheel drive car could present a different silhouette if only 2 seats were considered. Also a mid engine vehicle can sometimes have a radiator mounted beside the engine. This will remove the need for an aperture at the front for the radiator, and increase the size of the apertures along the side of the car (Lamborghini Diablo). These are another major component to package into a car, as they not only have to move up and down, the front wheels must also turn. All car wheels are roughly the same overall diameter of no more than 600mm, or 300mm radius. The proportion of the wheel to tyre is the part that will vary, along with the width. Race cars will sometimes have larger diameter wheels, but only at the rear. A key difference between road and race cars are the number of wheel nuts. 4 or 5 for road cars, but usually only one on a race car. 18 External projections 1. The vehicle shall not be fitted with any mascot, emblem or other ornamental object unless it complies with the requirements of regulation 62 of the Construction and Use Regulations. 2. The radius of curvature of all hard parts on or protruding from the external surface of the vehicle and which can be contacted by a sphere of 100 mm diameter, shall be not less than 2.5 mm. 3. Headlamp visors and rims shall not project more than 30 mm beyond the lens surface. 4. The ends of bumpers shall be turned inwards or recessed or integrated within the bodywork. 5. Handles, hinges, push buttons and fuel tank filler caps shall not project more than 40 mm from the external surface unless they cannot under any circumstance project beyond the extreme outer edge of the vehicle, in which case they may project by up to 50 mm from the external surface. All handles shall be enclosed in a protective surround or be recessed, unless they cannot in any circumstances project beyond the extreme outer edge of the vehicle. The result of all this is that positions of major items, such as headlights become very uniform across all car designs. Front and Rear lights are a good example, as they have to be at least 400mm from the centre line of the car on either side. This means there are usually 2 and they are usually a similar distance apart!